Bobby Brosnahan, nicknamed ‘Bobby B,’ ‘BB,’ and ‘Braz’ due to the tough pronunciation of his last name (pronounced braz’nahan), joined the Blue Jays organization last year after signing as an undrafted free agent out of the University of Michigan, an experience, the 23-year-old left-handed pitcher, explained as being a dream come true. “Having the opportunity to play professional baseball was always my biggest dream growing up,” he said. “Coming into my redshirt junior year at Michigan, I wanted to put myself in a situation to have that opportunity and I was able to do so. I remember talking to my area scout for the Blue Jays in the days leading up to the draft and I was hoping to get picked, but that obviously fell through. 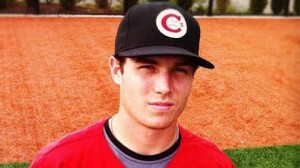 Brosnahan made his Blue Jays’ debut with the Vancouver Canadians on June 18th where he retired all nine batters he faced, striking out three in the process. While the young pitcher from Ann Harbor, Michigan looked calm and collected, Brosnahan admitted that he was both nervous and incredibly excited. “I was definitely amped up. That day was something I had been working towards for a long time and I wanted to prove to people that I belonged in professional baseball. I think my most vivid memory from that outing was the first batter hitting a missile at my first baseman for an out and my third baseman saying, “Welcome to pro ball.” After that I settled in, threw strikes, and I had a real good curveball that night. Brosnahan states that his competitiveness and eagerness to win lies not only with video consoles but also on the mound. “I’m a fierce competitor and have a lot of confidence in myself as a pitcher,” he said. Brosnahan joined the Blue Jays organization after spending three years with the University of Michigan, where he maintained a 9-17 record and a 5.29 ERA while recording 116 strikeouts in 175 1/3 innings pitched. “The University of Michigan gave me the opportunity to pursue my baseball career and ultimately put me in the position to become a professional baseball player,” he said. “In my freshman year, I was able to make an immediate impact and played a big role for my team. My sophomore year was a bit bumpy, but I learned a lot and was able to overcome several obstacles, which I believe really propelled me to have the year I did in my junior season. While ‘Bobby B’ said he had many memorable days in baseball, he further stated that his worst day would have to be when he found out he would require Tommy John surgery. Is he on Twitter or social media. I think I found a new favorite player. He sure is… follow him on Twitter at @45Bros.